Currently, secured loans still require credit checks due to the risk associated with reprocessing the good if the borrower defaults. Tokenized assets remove this overhead by allowing lenders to guarantee the retrieval of the asset, thus, significantly de-risking the lender. 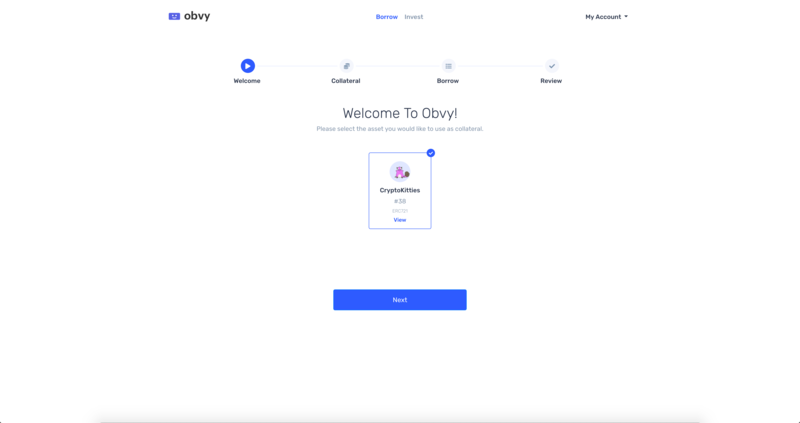 This platform serves as a lending marketplace: borrowers can collateralize their assets to acquire capital and lenders fill the loan requests. We plan to extend the platform to allow users to borrow capital to purchase tokenized asset and use the asset as collateral for the loan. For example, an individual will be able to purchase an asset that is valued at 100 dollars when they only have 20 by using the lending marketplace to fill the remaining portion. The asset is now pinned as collateral to the loan. The platform currently only works on the Kovan testnet. 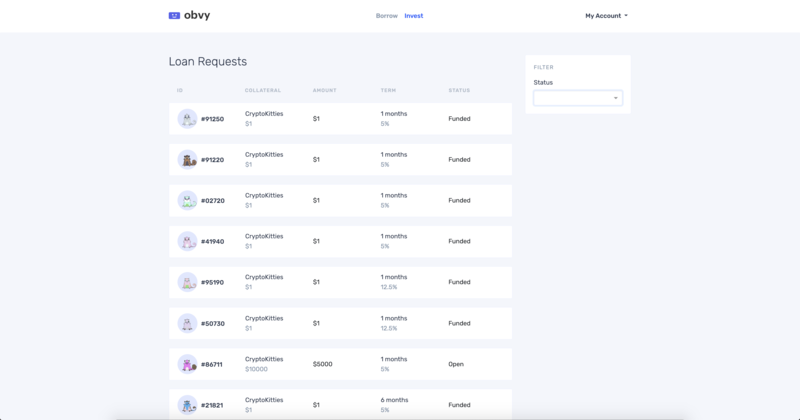 Due to the low supply of example ERC-721 tokens on the network we added the ability for users to mint test ERC-721 tokens. 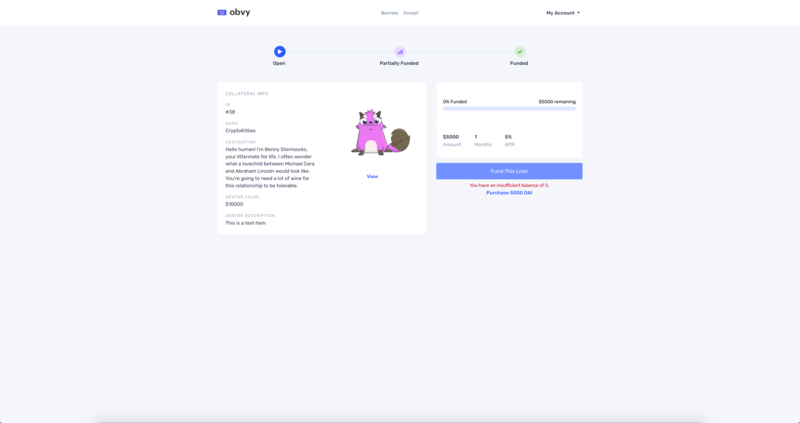 Borrowers fill out a loan request by selecting their ERC-721 token to be used as collateral, provide more context about the collateral and specify the loan terms they need. The loan request is then added to the network to wait to be filled by a lender. Once filled, the borrower can use the "My Loans" dashboard to make repayments on the loan. Currently, we only allow users to borrow DAI to avoid the volatility of the crypto market. If the borrower does not have enough DAI, an error message will pop up allowing them to acquire more. Lenders have the ability to browse through and search a list of loan requests waiting to be filled. 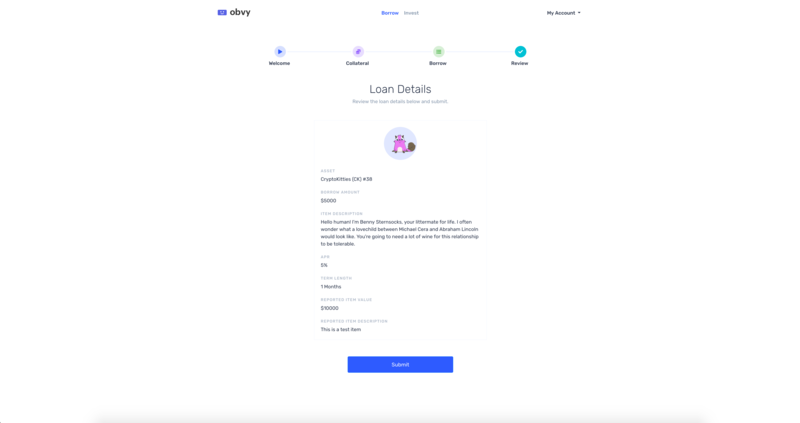 When they choose to fill a loan, the loan is sent to their "My Investments" dashboard, allowing them to keep track of the repayment status of the loan.